Keystone Resort will Present Free River Run Rocks! Concert on St. Patrick's Day Featuring Band of Heathens, Playing Live in River Run Village! Keystone Resort will present the third River Run Rocks! concert on March 17th. SummitCove guests can enjoy the concert in River Run Village for a fun St. Patrick's Day celebration! Keystone's Free Concert Series, River Run Rocks! ...One of the most fun Après ski parties around! SummitCove Vacation Lodging Guests can enjoy Keystone Resort's third River Run Rocks! concert of the ski season on Saturday March 17th. The concert will feature the Band of Heathens, out of Austin, Texas. 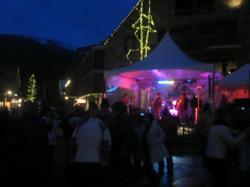 All concerts in the series are free to attend and are one of the most fun Après ski parties around! Enjoy a brew on the deck of 9280 Taphouse, Wolf Rock, or Luigi's while watching the scene or head up front to dance in front of the stage! A kids’ fun zone will be open to keep the little ones busy while you enjoy the music. An after party event will be held at Warren Station with the Ryan Montbleu Band playing Saturday Evening. Tickets are $10 at the door and the doors open at 8pm. Come out to celebrate St. Patrick's Day with this fun live music event! Keystone will offer one more River Run Rocks! concert this ski season, during closing weekend. The final River Run Rocks show is scheduled for Saturday, April 7, 2012 with Sam Bush headlining the event. Stick around for the whole weekend and watch pond skimmers take the icy plunge during the Keystone Slush Cup on closing day! There are lots of great events planned to finish out the 2011/2012 Keystone season with a bang! SummitCove is a vacation lodging company in Keystone Resort Colorado. SummitCove manages nearly 300 properties exclusively in Keystone Resort's five neighborhoods, including River Run Village and Mountain House.